A Peanut Butter Creme Centre in a Milk Chocolate Flavoured Coating. You already know the Easter Bunny. Now it's time to meet the Reester Bunny® Character! 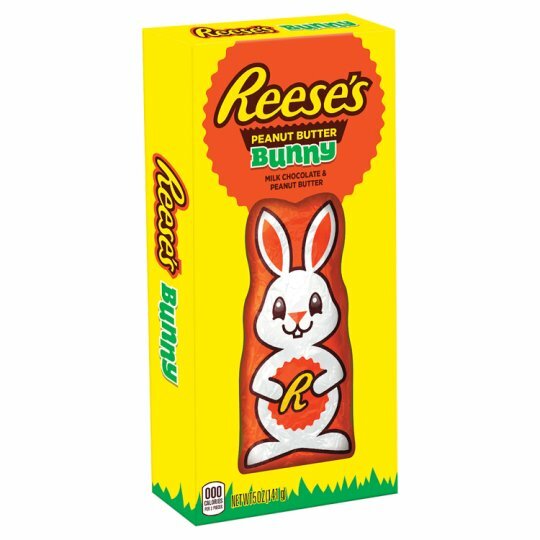 Always the best in the basket - because he is made of delicious milk chocolate, and filled with Reese's® Peanut Butter! The original Reese's Peanut Butter Cup was created in 1928 as a partnership between H.B. Reese and Milton Hershey. Since then, the Reese's family has grown to include a variety of flavours and forms. Today, you can try Reese's products in dark chocolate, white chocolate, snack-sized pieces and candy bars. If you're looking to add a little hippity-hoppity happiness to your Easter baskets this spring, look no further than HERSHEY'S Milk Chocolate Easter Bunny. To keep this product in perfect condition store in a cool, dry place (16 to 18°C) and consume before the date given.